Tying the knot in Scotland’s Greta Green is still a runaway success! First, some history: Back in 1754, English lords changed the law to make it harder to get married. They raised the age from 16 to 21 and insisted the ceremony take place in a church. The Scottish, though, said ‘nah!’ to these changes. Cue thousands of young English couples fleeing across the Scottish border to marry people their family didn’t want them to – with said family often in hot pursuit. Gretna Green was the first Scottish village on the main route from London. 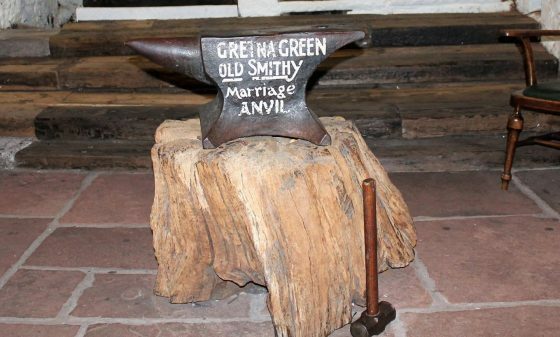 The local blacksmith spied an opportunity and started marrying the desperate couples over his anvil… and the legendary ‘anvil priest’ was born. 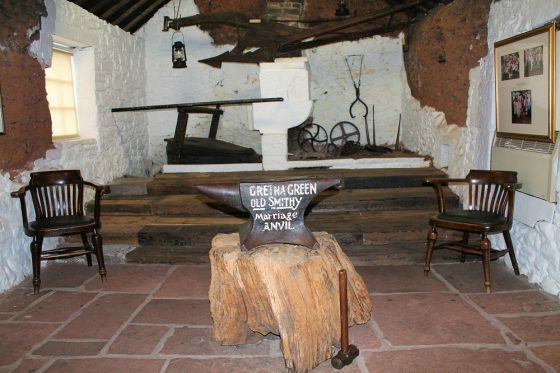 Today, about 1500 weddings and nearly 200 blessings take place every year within the Famous Blacksmiths Shop, the original marriage house. A multilingual exhibition on site recounts the tales of intrigues, elopements, scoundrels and angry parents arriving minutes too late. Lonely Planet calls it “entertaining”.